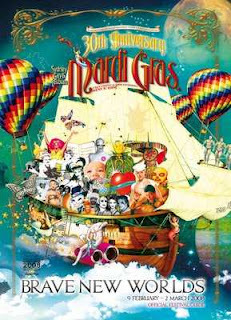 If every person who originally put their names down marched then there would have been 100 ministers marching in the Mardi Gras Parade, as an act of contrition. But as soon ecclesiastical and denominational hierarchies knew who was involved they threatened to excommunicate/defrock those who participated. For some, with families, mortgages etc to support the price was high and reluctantly they had to withdraw. Despite this, and pressure from the usual weird christian activists groups with their tiresome, clichéd arguments, 35 ministers made history and marched in this years Sydney Gay & Lesbian Mardi Gras parade. (Some still with the threat of loosing their jobs hanging over their heads). Almost every news story around Australia and overseas mentioned the significance of the 100 Revs participating. Nearly 100 have now signed the apology and more names are being added. There have been emergency meetings this past week in some denominational headquarters to try and stop what has happened. But the project looks like it will take off overseas as well. I'll be able to tell you more about this later. We will be keenly watching the way various Christian denominations handle this and certainly make known those churches who take action against any of the ministers who marched or have put their names to the list. It seems inconceivable that some denominations are considering penalising their ministers for genuinely demonstrating love and grace. If they had been immoral or preaching a heresy, then it would be understandable. But to discipline ministers for getting close to the people they have been called to reach out to and for acknowledging publicly that their attitude and some actions have been unchristian makes one wonder if they have somehow forgotten the very essence of the Christian message. Anyone, either in or out of the church, who knows about the Jesus of the gospels, will see this for what it is. 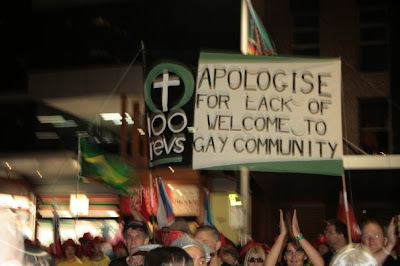 It was a privilege to march in the Gay and Lesbian Mardi Gras to convey our apology to the Gay Community in a concrete and symbolic way. We were included in the community section where there were several other Christian and religious groups as well as the armed forces and the police. Particularly noticeable was the contingent who were marching to drawing attention to the large number of laws which still discriminate against this one group of people even though we have other laws which legislate against discrimination! Amnesty International was there marching for Universal Civil Rights. As we waited for the march to begin quite a number of people came up to us to thank us for what we were doing. Some friends made special opportunity to convey their heartfelt appreciation. Some went round our whole group shaking each person by the hand and saying 'Thank you'. In some ways the hospitality of the Gay and Lesbian community was so gracious that we felt a rebuke as it is in the area of hospitality that we feel the church has been so remiss. Our attitude has been excluding. For me personally there was a sense that we were standing on Holy Ground as people connected with our act of contrition. It also felt during the march that we had the amazing privilege of making known the truth of God made known in Jesus who constantly took himself to the margins and to those who were left out and offered love and acceptance. As the march moved through the crowd we received a warm welcome and people acknowledged their awareness of what we stood for and their approval of what we were doing. The very air seemed to be charged with an atmosphere not only of elation but also of safety, respect and acceptance. 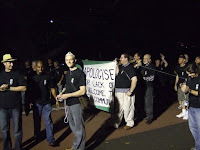 Those who marched last night with 100Revs would like to thank all the members of the GLBTIQ community for their hospitality at the march and the graciousness with which they received our apology. The officials were really helpful in guiding we newbies in unfamiliar territory. The other members of the parade welcomed us, and the crowd cheered loudly (with some encouragement from Tony "I can't hear you!" Gibson) as we walked past. Several people shook every member's hand, and many connected with us individually, to thank us for the apology and convey how much it meant to them. Everyone was very warm and welcoming toward us. Thank you! We pray that this signals a new era of the church being truly a place of welcome, and a place of prayer for all people.